The 125th anniversary of Crouse College’s chimes will be celebrated on Tuesday, June 3, at 6 p.m. with a special concert by the student group the Chimesmasters. The public is invited to sit on the lawns surrounding Crouse College and enjoy the free concert. The Chimesmasters, who are responsible for ringing the chimes regularly throughout the academic year and for special occasions, will present a program featuring classical, contemporary, patriotic and pop music. Crouse College’s bell tower was designed to house the first tower chimes installed in Syracuse. 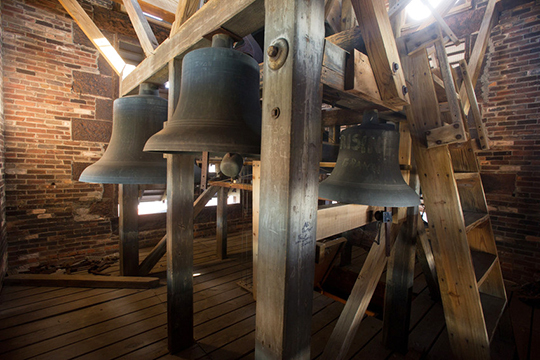 The original nine bells were manufactured by Clinton H. Meneely Bell Company of Troy, N.Y., and donated by John Crouse, the Syracuse businessman and Syracuse University Trustee who funded the building of Crouse College. Installed in 1889 and first rung in June of that year, the bells range in weight from 375 to 3,000 pounds. The bell metal consists of copper (78 parts) and tin (22 parts). A 10th bell was added in 1937. The concert is presented by the Rose, Jules R. and Stanford S. Setnor School of Music in the College of Visual and Performing Arts. Free and accessible parking is available in the Q1 lot. Additional parking is available in the Irving Garage. Campus parking availability is subject to change; call 315-443-2191 for current information or for more information about the concert.